Wow! Welcome back! 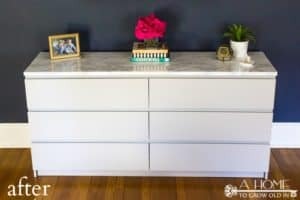 I can’t believe we are half way through the One Room Challenge! It’s crazy how fast the time flies during this challenge. If you are new here, thanks so much for checking our powder room makeover out. You can check out all of my weeks’ progress at the bottom of this page if you’d like to get caught up. I’m so excited because I feel like we have made some major progress on this room! I’m sharing one of two big projects we are doing in this room with you today…our easy DIY planked walls. I’ve been reading about how to do this for quite some time, and as far as DIY projects go, this one is really pretty easy for the amount of impact it has. To start, I primed the walls of the powder room. Our walls previously had wallpaper on them, so I wanted to make sure to seal them in case there was any wallpaper glue or remover solution left on them. This step isn’t necessary for most rooms, but if you don’t prime, you will definitely want to give your walls a coat of paint the same color that you will paint your planks because there is a space between the boards where the wall will show through. We purchased two sheets of .25″ plywood from Home Depot and had them cut it into 6″ strips. This is something that would have taken us quite a bit of time to do, but they were able to do it in about 2 minutes! They did have a sign posted that there was a very minimal charge for cuts, however, they did not charge us! Score! Next, we measured how long the strips needed to be and used our table saw to cut them to length. I sanded the fronts and edges to make sure they were smooth with no splinters. One step that I did not do, but looking back wished I had, was to prime the edges of the boards. 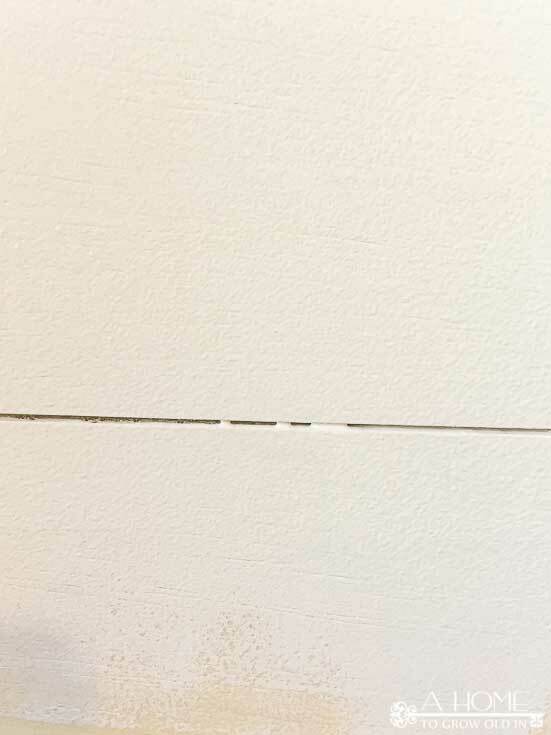 I assumed the space in between the boards would be easy to paint, but I think it would have been a lot easier to do before the planks were on the wall. Before putting up any boards, we found the studs in the wall with a stud finder and marked them. We started putting the planks onto the wall at the baseboard. It is incredibly important to make sure each of your boards are level as you put them up. You can see that we had to use a stack of nickels to get this first board level. 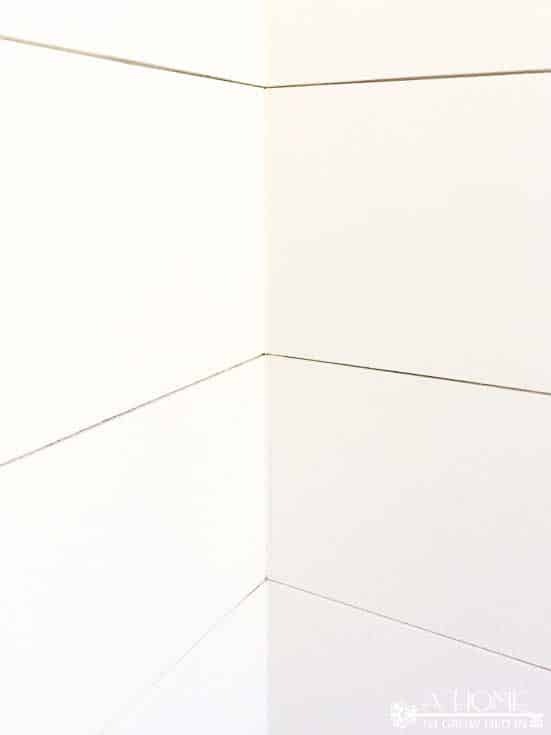 Don’t worry about the initial gap because you can fill it in with caulk and never see it again! The first board is definitely the most challenging to get level, but it goes pretty smoothly from there. We nailed the board onto the wall with a nail gun at each of the studs. Because our powder room is so small, it was definitely a tight fit with our air compressor. At the Haven Conference I attended this summer I was able to try this cordless nailer. I loved how quiet it was (my kids run out of the room whenever we turn on our air compressor so maybe noise isn’t a bad thing) and that you did not have to lug around a big air compressor. If you don’t already have a compressor and nail gun, I would definitely recommend it. Once we had our first board up, we used a nickel as a spacer between each of the planks as they went up. 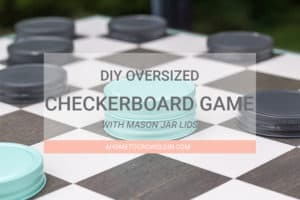 We still checked to make sure each board was level as they went up and sometimes had a little more than a nickel’s space between the boards, but it’s not something you notice when it’s done. Since we are not going all the way to the ceiling with our planked wall, we wanted to add a simple trim to the top. We cut a strip of wood trim .75″ by .75″. Home Depot had trim pieces that were a similar size, we were just working with what we already had on hand. 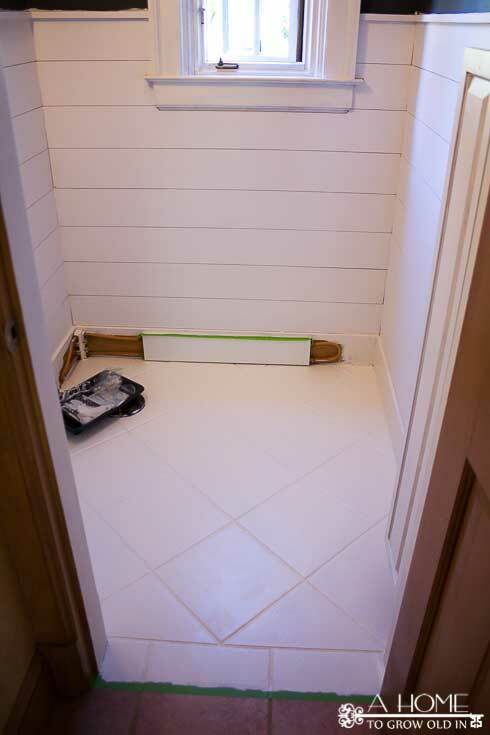 Putting the planks up in a bathroom left us with a couple of trickier areas. The first was the plumbing behind the sink. The drain pipe was the largest area, so we made a full cut there to make it easier and used a jigsaw to a make some notches. For the smaller pipes, we simply notched out a small piece. This area will be behind the vanity, so it won’t be noticeable. The other tricky area was the electrical outlet and light switches. 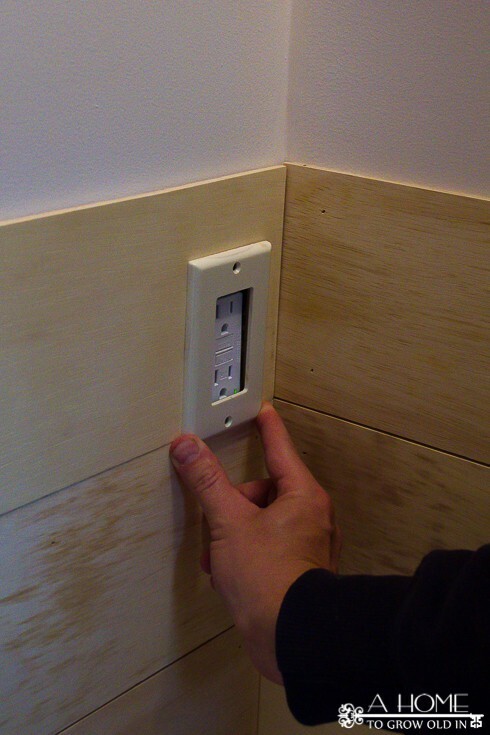 We also cut out this area with a jigsaw, but the switch and outlet became recessed with the thickness of the plank. Luckily, there is a crazy easy way to fix this with electrical spacers. This works great on any outlets or switches that may be slightly recessed behind the cover plate. You are not messing with the electrical wires, but I recommend turning the power off to the outlet anyway. 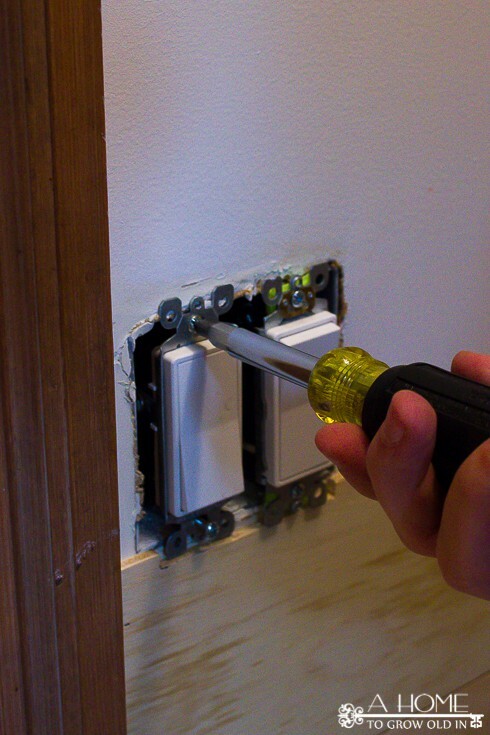 Simply loosen the screws that attach the outlet or switch to the wall. 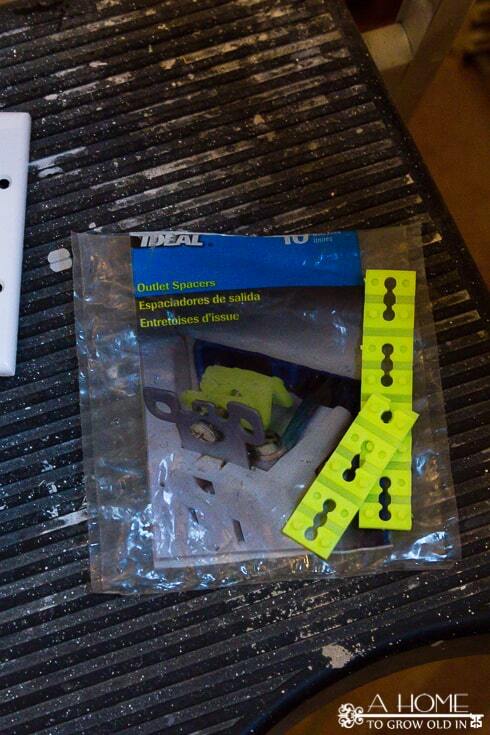 The strip of spacers can be cut apart and you can use as many as you need to make the outlet flush with the cover. The spacers stack on top of each other to bump the outlet out further. Once you figure out how many spacers you need to make your outlet flush with the plate cover, slide the notched area of the spacer over the screw and screw it back into the wall. You can just barely see the bright yellow spacer behind the top screw of the right switch below. That’s it! 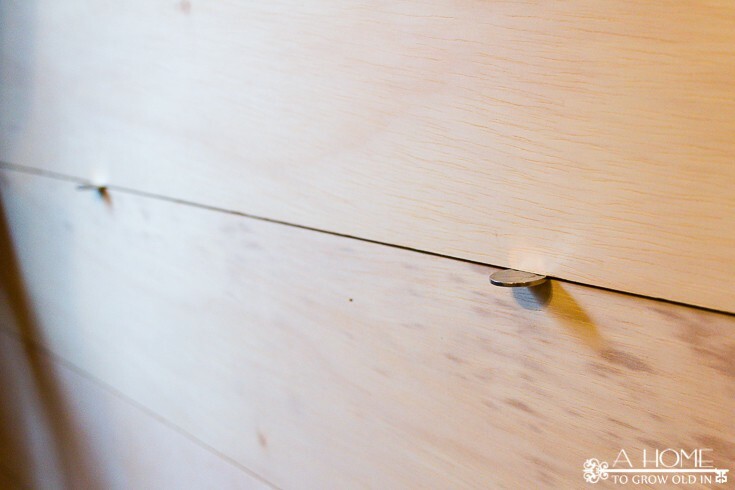 The last thing to do before priming and painting your wood is to fill in all of the hundreds of nail holes and sand them down. Priming and painting are pretty easy if you’ve already primed the edges of your boards (hopefully you’ve learned from my mistakes). If you are painting your planks white, you don’t have to worry too much about getting paint into the gap if you’ve already primed it. If you are not painting them white, you may want to look into having your primer tinted to match your paint. 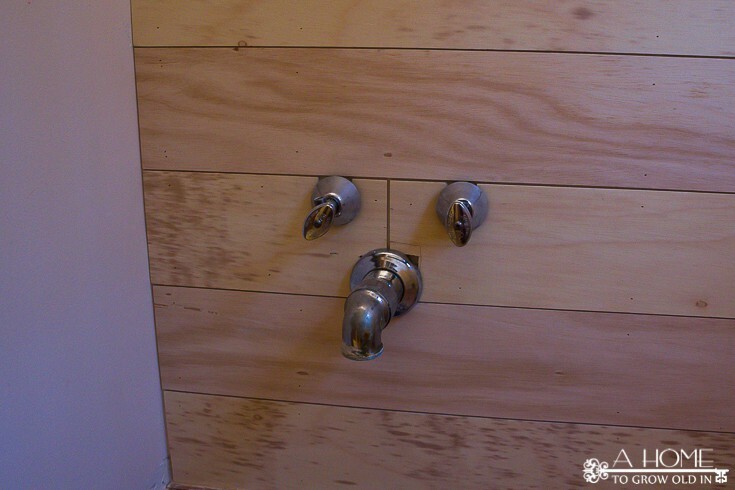 I used 3 coats of primer on my planks because I kept seeing spots from the wood showing through. You may not need as many. During the priming and painting, I had a few areas where paint would collect in between the planks. 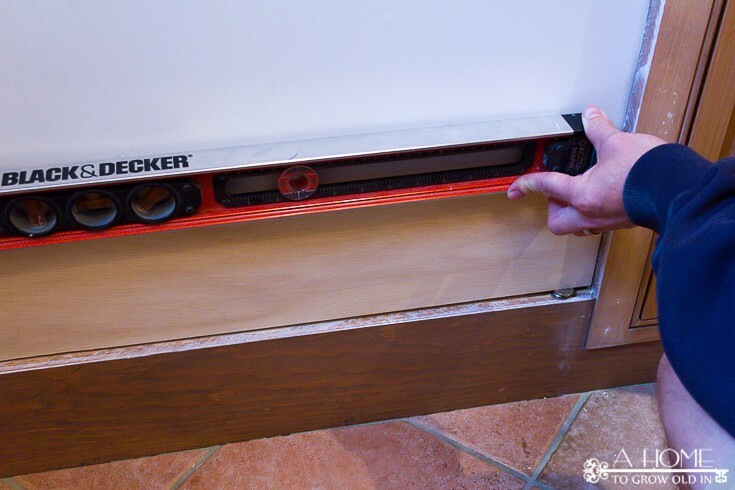 Running a credit card or putty knife through the gap works great to remove them! I like to caulk after I prime so it’s easier to see anything that needs to be filled. In the corners, I wanted to keep the gap between the planks so I tried not to put any caulk there. If I did get a little caulk in the gap in the corner, I just used my credit card or putty knife it smooth it out. Here’s a look at everything primed and ready for caulk! Even the floors are ready for their stencil! Did you see my sneak peek of the floors on Instagram? I’m so excited about how they are turning out! What do you think about our planked walls? If you’ve been thinking about doing planked walls, you should go for it! It’s a great beginner project if you’re wanting to try out some new tools. Next week, I’ll give you the info on the stenciled floor tiles. I’d love for you to sign up for my email newsletter so you won’t miss it. 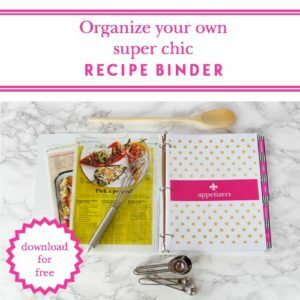 Email subscribers also have exclusive access to my printables library! 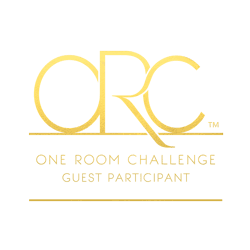 Don’t forget to check out the other amazing room transformations going on in the One Room Challenge! 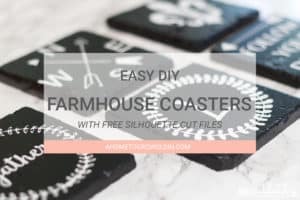 Do you like printables? Sign up to receive my weekly newsletter and you will receive access to my exclusive printables library. Way to go girl, that looks great! You have some serious DIY skills! I can’t wait to see the finished room. Thanks! I really should have given my husband more credit here, though! I pretty much just help hold the boards up while he does the hard stuff. I do all the sanding, caulking, and painting, though, so there’s my contribution! I can’t wait to see your bathroom completed! Each and every step so far is leading to something fabulous!!! So exciting!!! Me, too, Tammy! I can’t wait to show you how the floors turned out! Thanks for checking it out again this week! Wow! Amazing transformation! Loving the progress – can’t wait to see the final reveal! Thanks, Jen! It’s really coming together, and I’m so excited about it! You are Rocking it Girlfriend!!!! It looks fantastic and really freshens the room up. Are you having fun? Thank you! I can honestly say this room has been a lot of fun. It’s really refreshing to work on a small room where the projects don’t get drawn out forever. It looks great so far! I cant wait to see it! It’s looking great Robin! I missed that Instagram shot, now I need to go back and find it! Can’t wait to see the finished space! This is so smart Robin. A neighbor asked me about installing shiplap a few days ago. I sent her a link to this post today! Robin, How on earth did I miss this last week? This looks fabulous and perfect! I want to do this on a wall in our guest room and in our lower bathroom, but hubby is thrilled about it. (It’s an age thing) Anyways, I LOVE what you’ve done so far! Hi, Carol! This was fairly easy considering what a big impact it has on the room. I think we got the whole thing done in about an afternoon. Thanks so much for checking it out!